Impressive graphic design and really impressive size set it apart from other suiting quilts of the era which were typically for twin or 3/4 beds. 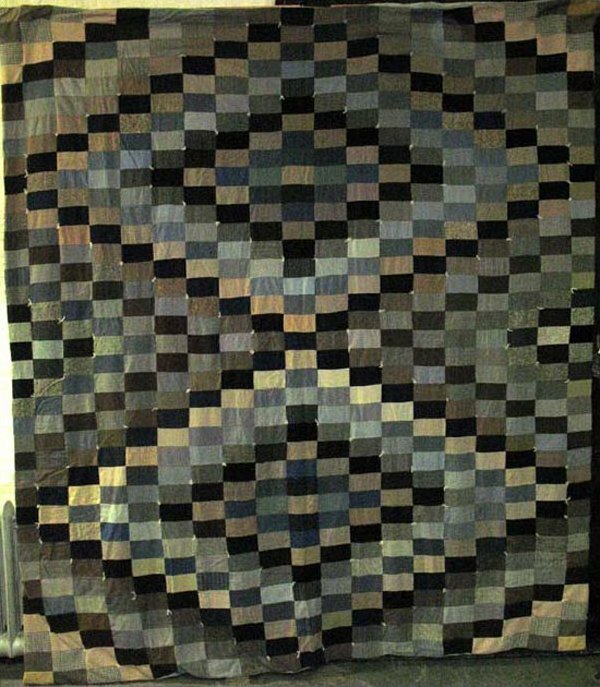 This almost monochromatic graphic is more like a Vasarely painting than it is a quilt, considering the skilled placement of the many varied shades of grey that form the bold diamond motif. The suiting pieces are most likely remnants from tailoring or manufacturing. Similar suitings quilts were the subject of my NEQM show MASTER PIECES, and my Quiltmania Magazine article MALE ENHANCEMENTS: Suit-Able Quilts. Tacked with wool yarn at regular intervals at the corners of the pieces rather than quilted.